There is nothing better than being out in the middle of nowhere on vacation, with your loved ones. Better yet, stop at a quiet abondonded beach and run around in the ocean for an hour, then stop into a tiny church thrift store and look at some records! This makes (I think) the 14th year consecutive I have spent in Orlando in the fall. Coincidentally, I was just in Tampa for a week just a bit before, but that was for work. 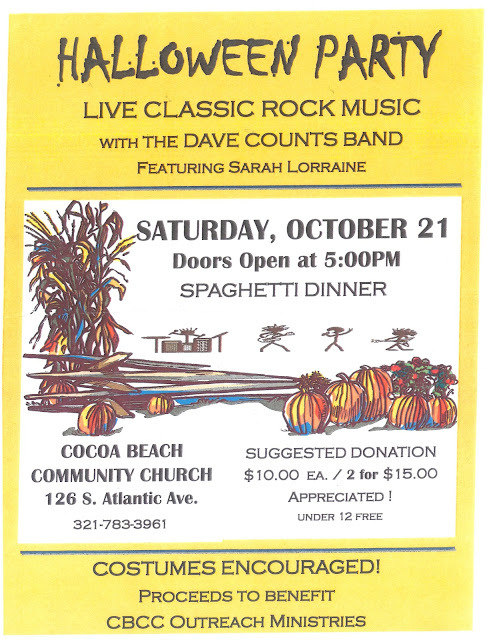 I used to come out to Cocoa every year when I'd be in O-Town but I stopped years ago since I gave up on renting a car. Well this year I did and it was well worth it, our dip in the ocean alone was rewarding enough and this little thrift store was everything such a place is supposed to be. What an odd record, especially way down here in Florida. Located at 133 S Orlando Ave, Cocoa Beach, FL 32931 - I did my dig, a total of three nice bins. I did come out with something believe it or not! I have always loved the track since I was a kid and it was current. Nice to have the 12" with the remixes. This lady (below) was super loud and bordered on obnoxious but she meant well. She did not know I took this photo but you'd swear she did. Her personality shines through. My biggest regret of all is not being able to attend the below. A party - WITH SPAGETTI?!?! - at a church, a week before Halloween, with live music??? And not 1/4th mile from the ocean? This was of course the day we were leaving, by 5pm we were long since home. I'll forever regret missing the Dave Counts Band but I'm certain a great time was had by all.